If you have any questions, or if we can be of further service, please feel free to contact us. You shall have an answer soon. Name : Mr. Ms. Mrs.
capacity for the necessary movements of the excavator arm. Hydraulic internal vibrators for VMH-150 are especially suitable for mass concrete compaction of biggest granualation(max.Ø approx. 250mm) because of their high centrifugal forces. All these components are carefully mated together and provide therefore a long life and a high reliability with high power, which is necessary for this hard application. 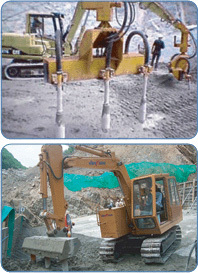 The vibrators are operated by the hydraulic system of the carrier vehicle. Consult our experienced application technicians.